The biggest change since I left Wall Street is the rising dominance of what’s called passive investing. The basic idea of passive investing is that you buy into a preselected basket of stocks called an index. For example, if you want to buy into the U.S. stock market, many people buy the SPDR S&P 500 ETF (NYSE Arca: SPY). This exchange-traded fund (ETF) has the biggest 500 companies that trade in U.S. markets. The reason why passive investing is dominating is its low cost. For decades, Wall Street was able to charge huge fees to clients because people simply couldn’t buy into the stock market cheaply through an index fund. All that changed with Vanguard. It was founded in 1975 by John Bogle to give people a chance to invest cheaply in the stock market. And Vanguard is absolutely in the sweet spot to benefit from the biggest demographic trend in over 30 years. That demographic trend is the millennial generation — 92 million strong and about to experience its strongest period of income growth. That means they are going to be putting their money into the stock market in massive numbers soon. And because millennials are more financially savvy and educated than previous generations, they are putting more money into passive investing through ETFs. Vanguard is primed to get much of the millennials’ stock market business thanks to a general distrust in Wall Street and investment banks. 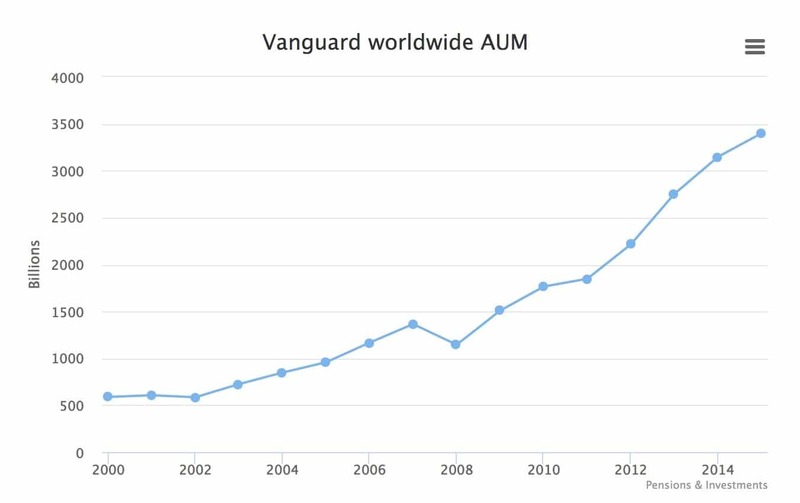 Vanguard has been dominating the passive investing market for 15 years now, going from about $500 billion in assets under management in 2002 to almost $3.5 trillion today (see the chart above). That’s absolutely extraordinary growth. If Vanguard were a stock that you could buy into, you’d want to own lots of it. But Vanguard is a company that’s owned by its customers. It recycles its profits into lowering fees. However, there are other ways to play the massive shift into passive investing and ETFs through companies that are beginning to copy Vanguard. These are the kinds of opportunities I show people in my premium service, Profits Unlimited.